Today President Barack Obama will sign an executive order to crack down on contractors that don’t comply with workplace laws. The order—based on successful best practices from both the public and private sectors—will help protect the more than one in five Americans who are employed by companies with federal contracts, prevent the waste of taxpayer dollars, and allow law-abiding companies to compete on a fair playing field for government contracts. The federal government—which contracts out hundreds of billions of dollars worth of goods and services every year—must only contract with companies that have a satisfactory record of performance, integrity, and business ethics. But the contracting system does not effectively review the responsibility records of companies before awarding contracts, nor does it adequately impose conditions on violators that encourage them to reform their practices. Instead, the federal government all too often awards contracts to workplace violators with no strings attached. As a result, contractors that violate wage and workplace safety laws have little incentive to improve their practices. Even companies with the most egregious violations of workplace laws continue to receive federal contracts—the government awarded $81 billion in federal contracts to these companies in fiscal year 2012 alone, according to a 2013 report from Sen. Tom Harkin (D-IA). This not only harms workers—many of whom have been killed, injured, and shortchanged tens of millions of dollars by law-breaking contractors—but also taxpayers, since contracting with companies that have egregious records of workplace violations also frequently results in poor contract performance. The order builds on best practices from state and local governments, private-sector companies, and, in limited instances, federal government agencies that have adopted thorough responsibility screenings to review a potential contractor’s workplace record before entering into a contract. These laws and policies—which, in some cases, have been on the books for more than a decade—have improved contract performance and protected workers. Moreover, these laws help ensure that law-abiding companies can compete on a fair playing field for government contracts. Many states—including California, Connecticut, Illinois, Massachusetts, Minnesota, and New York, as well as the District of Columbia and other major cities, including Los Angeles and New York City—have responsible bidder-screening programs. They have adopted these laws to improve the quality of their contractor pools and do a better job of identifying companies with long track records of committing fraud, wasting taxpayer funds, violating workplace laws and other important regulatory protections, as well as those lacking the proper experience and licensure. For example, Massachusetts has enacted a prequalification process for contractors bidding on state and local public-works projects, which is mandatory for projects of more than $10 million and optional for smaller projects. Prequalification is based upon various factors, including a review of the firm’s safety record and compliance with workplace laws. The Massachusetts attorney general’s bid compliance unit—which enforces the state’s prequalification law and reviews challenges to agency contract award decisions—resolved 218 protests in fiscal year 2009, the most recent year for which data are publically available. New York law also requires state agencies to make a determination of responsibility before awarding a contract and encourages the use of use tools such as vendor certification and ongoing monitoring to correct problems found in responsibility reviews. New York State Comptroller Thomas DiNapoli approved a $4.7 million painting contract in May, but only after the state transportation agency appointed an independent integrity monitor to ensure that the contractor complies with wage laws. The comptroller—who reviews contracts for state agencies—had previously rejected the contractor due to an apparent connection to companies that were debarred for wage violations. Some federal contracting programs also use a thorough responsibility review process in order to improve contract performance. The U.S. Department of Defense conducts a pre-award safety survey—which includes a review of safety history and accident experience—on all department ammunition and explosives contracts. The U.S. Chemical Safety Board—an independent federal watchdog agency—issued a recommendation last year that the government establish similar safety review requirements for all federal contracts after an explosion killed five workers at a company contracted by the U.S. Department of the Treasury to dispose of fireworks. The Board is not telling agencies what to do. When we issue an alert, we are throwing up a caution flag—take care, we are saying, before handing out that contract. Bottom line: [The program] can be used throughout the lifecycle of an award and will reduce fraud and improper payments, saving taxpayers money. Even in the private sector, it is becoming increasingly common for companies to factor in a bidder’s workplace safety record in contracting decisions. A number of industry associations, including the Construction Users Roundtable, the American National Standards Institute, and FM Global recommend evaluating the safety record of companies that are bidding for contracts. 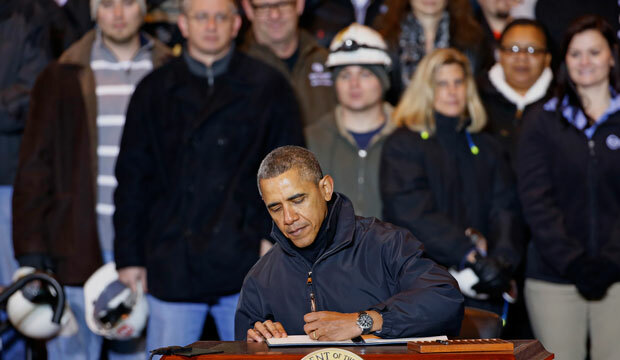 President Obama’s order will help guarantee that companies that respect their workers are not put at a competitive disadvantage compared to bad actors that reduce costs by paying wages lower than required by law and cutting corners on workplace safety. While opponents have argued that that these sorts of policies could bar companies with minor workplace violations from receiving any federal contracts, improved responsibility guidance and a thorough investigation process will allow the government to identify only persistent violators of workplace laws and provide them an opportunity to clean up their acts. States and localities have found that adopting laws to raise workplace standards among contractors actually increases competition among responsible companies, according to a report from the National Employment Law Project. For example, after Maryland implemented a contractor living standard, the average number of bids for contracts in the state increased nearly 30 percent—from 3.7 bidders to 4.7 bidders per contract. Nearly half of contracting companies interviewed by the state of Maryland said that the new standards encouraged them to bid on contracts because it leveled the playing field. Too often, we are forced to compete against companies that lower costs by short-changing their workers out of wages that are legally owed to them. The District of Columbia’s contractor responsibility requirements haven’t made the contracting review process too burdensome. And now we are more likely to bid on contracts because we know that we are not at a competitive disadvantage against law-breaking companies. By adopting the order, President Obama is building on best practices from state and local governments, private-sector companies, and even some federal government agencies. The executive order will make a considerable difference for the more than one in five Americans who are employed by companies that receive federal contracts, improve the quality of services provided to the government, prevent the waste of taxpayer dollars, and allow law-abiding companies to compete for government contracts on an even playing field. Karla Walter is Associate Director of the American Worker Project at the Center for American Progress Action Fund. David Madland is Managing Director of Economic Policy and Director of the American Worker Project.